Today is the appearance anniversary of His Divine Grace A.C. Bhaktivedanta Swami Prabhupada. He was born in 1896 in Calcutta, India, into a family of Krishna devotees. At age twenty-two, he met his spiritual master, Srila Bhaktisiddhanta Sarasvati Thakur, who encouraged him to spread the mission of Chaitanya Mahaprabhu in English. 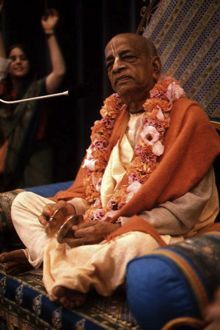 At the age of sixty-nine, Srila Prabhupada left India for the U.S.A. with a trunk full of his own Srimad-Bhagavatam commentaries. In the next twelve years, he started a worldwide movement, the International Society for Krishna Consciousness, and had translated over eighty books on Krishna consciousness. His followers fast until noon today and prepare a feast in his honor.